Crete is the largest island in Greece and the fifth largest island in the Mediterranean Sea with a population of 622,913 people. 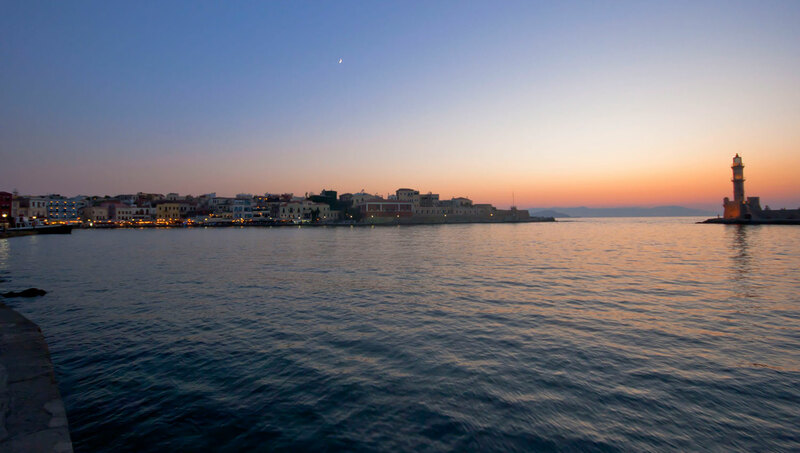 It covers an area of 8,303 km2, with a coastline of 1046 km and it is divided into four regional units whose capital cities are Chania, Rethymnon, Heraklion and Agios Nikolaos. Crete was once the center of the Minoan civilization (3000-1400 BC), which is currently regarded as the earliest recorded civilization in Europe. Chania regional unit lies along the west part of the island and covers an area of 2,376 km2 with a population of 150.387 people. It borders with Rethymnon in the east while the three other coasts are washed by the Mediterranean Sea; the Cretan Sea in the north and the Libyan Sea in the South. The majestic mountain range of the White Mountains or Madares forms the mountainous backbone of the region. It has many peaks, the highest of which is Pachnes (2.454 m). Koumares: In the south of the village and in a distance of one kilometer, there is the Arias Forest (it is a kind of acorn or azilaka in the local dialect), an area also known as Koumares. The dense vegetation of the bushes, the arbutus and the acorn forest is run through by a torrent as well as sources of clean, transparent, potable water; all these compose a green, shady landscape ideal for walks and exploration. Kournas: In the west of Kastellos and in a distance of 2 km there is the Kournas village with its lake, the unique natural lake of Crete. It is an ideal region for walks, swimming, paddle boats and delicious traditional food at the many taverns near the lake. The Church of Saint-George in Kournas: The Church dates from the end of the 12th century. Inside the church, parts of exceptional murals are saved. The Church of Saint-Irene in Kournas: The byzantine icons of saints date from 1362. The important distance of the church from the urban centers resulted in its protection from the Venetian influence. Thus, its murals preserve the Cretan style of the Byzantine art. The Church of Saints-Theodori in Patima: It is located in a distance of about one kilometer and it dates from the 14th century. The Church of Saint-Anne in Fylaki village: In a distance of two kilometers, with the impressive icons date from the 16th-17th century. In the north wall of the Church there is a sculpted tomb which belongs to the great Cretan family of Kallergis. The Beehive tomb of Fylaki: On the slope of a hill, in a distance of one kilometer in the north-west of Fylaki village, an important beehive tomb (tholos tomb) of Post-Minoan period (14th- 13th century BC) came to light in 1981. The sources of Saint-Power in Argyroupolis: They are located seven kilometers in the east of Kastellos. Sources, old mills, small cascades, dense vegetation and taverns with traditional plates make this place ideal for walks, tours and relaxation. Argyroupolis: It is built on the same spot where the ancient Lappa used to be. The village is full of traces of ancient and contemporary civilization (parts of the ancient city, Roman relics, Venetian buildings with beautiful doors, Byzantine churches). Church of the Five Virgins: It is a small rectangular church partially sculpted in the natural rock, located outside Argyroupolis (it is celebrated on Easter Tuesday). Nearby villages: Not many kilometers far from Kastellos, there are many villages with obvious traces of the ancient Greek, Roman, Venetian and Turkish presence in the region. Dramia, Kournas, Patima, Fylaki, Exopolis, Mathes, Kalamitsi, Episkopi and Archontiki do certainly worth a visit. Georgioupolis: In the north-west, in a distance of six kilometers, you can find the tourist village of Georgioupolis. Its beautiful beach is the place where Almiros River flows into the sea. In an islet not far from the coast there is the picturesque Church of Saint Nicolas, accessible via a path of natural rocks. Kavros: Seven kilometers east of Georgioupolis towards Rethymnon, there is the tourist village of Kavros where you can visit the longest sand beach of 6 km total length.